Hi guys! So Halloween is fast approaching, and many of the manufacturers have released some sort of Halloween collection. I have picked up various ones from here and there, so today I am going to share 'Haunting' by China Glaze. It's a black polish with silver glitter. Easily opaque in two coats, this is a fun alternative to a straight black polish. Heyyyy there everyone!!! I FINALLY have internet set up in my new place! So I could FINALLY pick the winner of my 500 Follower Giveaway! I apologize for the delay!! Moving totally got in the way of my nail polish life! But I'm set up and ready to get back in the groove! So first things first... the winner! Congratulations to Amber! I have e-mailed her letting her know. If I don't hear back within a reasonable time I will pick a new winner. So onto other things! 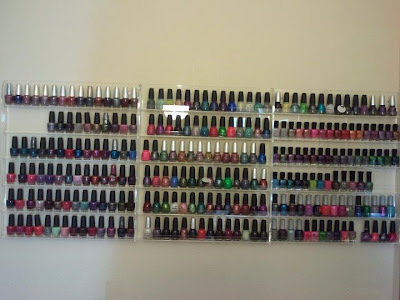 I have put up my polish racks!! 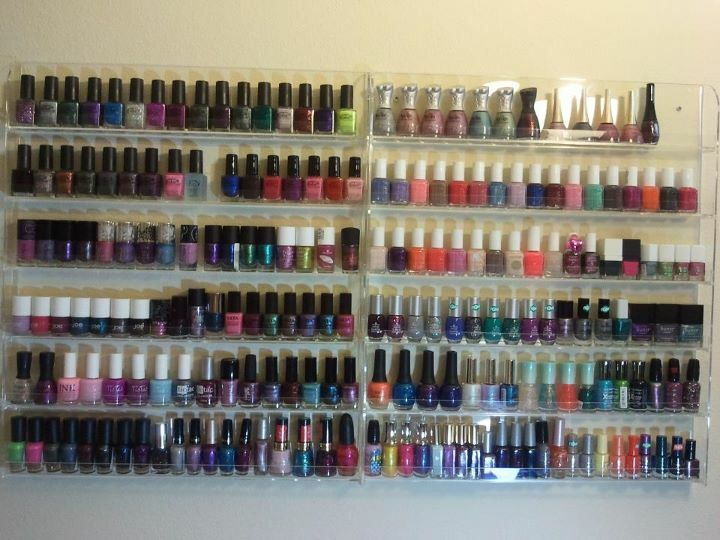 Now mind you, these pictures aren't the best, and the polishes aren't fully sorted. I will put up better pics when I take some... but this is officially my new favorite part of my apartment! Hope you all are doing well and I am looking forward to getting back into my blogging groove!! Happy Friday everybody!! I mentioned this brand, Tic Tac, in a previous post, and I recently picked up a few more polishes by them. They are pretty cheap and I really like them!!! Some of their polishes have actual names, and some are just numbers. Some polishes have the same number, but are two different colors. I don't know how organized they really are, but eh.... I don't really care. If I like the color, I grab it :) The one I am showing you all today is called 'Blue Sky'. It's a pale, pastel blue, and I don't have another polish of a similar color! These can be somewhat streaky in application, but usually the third coat has everything evened out. Just make sure you let the coats dry in between applications. :) This is 3 coats of 'Blue Sky', and no top coat! Have a great Friday and weekend everyone!!! Hi guys! So! As I'm sure many of you know, Orly recently came out with a new collection called 'Birds of a Feather'. I posted about a color called 'Sweet Peacock' a few weeks ago, and today I'm going to share with you the other color I purchased from this collection. It's called 'Fowl Play', and has been deemed a dupe of the hard to find OPI "Merry Midnight". I'd have to say I agree. I am fortunate enough to own both of these, so below are pictures of both the OPI and Orly version of this lovely color. It's a dark purple jelly polish full of multi-colored flakie pieces. In the pictures below I have two coats of each. 'Merry Midnight' is rare to come across, but you can always try ebay or swapping with someone. I picked up 'Fowl Play' at Ulta, so that is probably your best bet to find it. Otherwise, it is probably available online somewhere. I really like this polish A LOT, so I don't mind owning both!! I think these are similar enough that you don't need to own both. This is especially helpful since the OPI version is nearly impossible to find. Can you guys tell a difference? Thanks for stopping by, and have a great day!! Hi everyone! Happy Hump Day! I am so happy this week is half over!! It just means I am closer to the weekend which means I am moving into my new place in California!!!!! :) :) :) Today for Pink Wed, I have OPI DS Reserve to share! It's a nice coral-ly pink with scattered bits of holographic glitter. The formula was great, and this is two coats! Howdy Folks!!! In yesterday's post, I mentioned my dear friend Karin. She is someone I met through the nail polish facebook community. We decided to meet up one day and go polish shopping, and the rest is history! I love hanging out with her, getting our sushi lunches (even though the place we went to stopped selling sushi!!!!! ), and shopping for nail polish! You should totally check out her blog! On Sunday when we met up, she totally surprised me with one of the best gifts I've ever received. It is a polish that I have been wanting for SO LONG, but never coughed up the $ for. It is an AMAZING purple, holographic polish. It is, Ozotic Pro 513. OOOOOOMMMMMGGGGGGGG!!!!!!!!!!!!! My jaw hit the floor when she gave it to me. So Karin, thank you, from the bottom of my heart!!! I will miss you when I'm moved, but I know I'll be seeing you in CaLi!!!!!!! Ok, so, about this polish. First, the color. It's incredible. It's a great shade of purple. Not too red based, and not too blue based. The holographic qualities of it are amazing. It is linear and bright and vibrant. But, the most important thing of all... it applies like a dream!!! None of the streaking or dragging some OTHER holographic polishes have. Nope, it just goes on, smooth as BUTTAH!!!!!! Two coats of pure joy! Holy moly it's been a bajillion years!!!!!! I hate having gone this long without posting, but my life has been crazy these past few weeks!! I packed up my whole apartment and drove halfway across the country, only to unload everything into a storage unit. 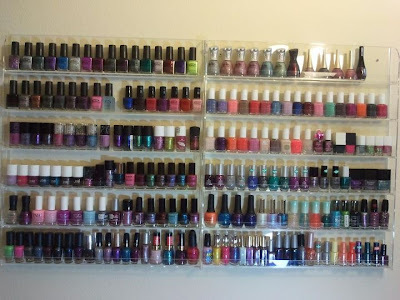 All of my polishes (except for a few) are in storage (which was BY FAR, my heaviest box!!!!). I spent the weekend in California at a friend's place, and then flew back here, to IL to train my replacement. I've been living out of a hotel for the past week, and will be in one until Friday! Then I fly back to Cali and have to unload everything from the storage unit into a truck, and then FINALLY move into my new place on Saturday! WHEW! I can't wait for all this moving crap to be OVER! I purchased quite a few nail polish racks, so when I finally have my "Wall of Polish" set up, I'll be sure to share it with you guys! It's like artwork to me! Yesterday, I spent the day in the city with Karin visiting some supply shops. I am so glad the polish community brought us together. I am really going to miss her!!! She gave me a special surprise polish that was a late birthday present / good luck living in your new place present. I can't wait to share it with you.... it's amazing!!!! :) But anyway, I picked up a few polishes yesterday so I will have lots of goodies to share with you this week!! Today I have two polishes I picked up from the Orly Mineral FX collection. Overall I liked the collection, but only two of the colors really spoke to me. I got these at Sally Beauty... it seems like they are in pretty limited quantities, so if you like any of them, I suggest going out and getting them ASAP! First up is Rock Solid. It's a shimmery, steel gray color with scattered holographic glitter throughout. Two coats achieved full opaqueness, and the formula applied really well for me. I really enjoy this color! Second, is a color called Rococo A-Go-Go. It's a gorgeous shimmery dark plum color, with a gold-ish duo chrome and pink sparkles. It applied like a dream, and could be a one coater. I did two for good measure. It's SO pretty. I will be wearing this color a TON, I can tell.